Doppo Black Beer for Unagi is a 5% Schwarzbier by Miyashita Brewery, based in Okayama, Japan. It’s part of their all-year round range of beers and can be found in bottles and on tap across Japan. 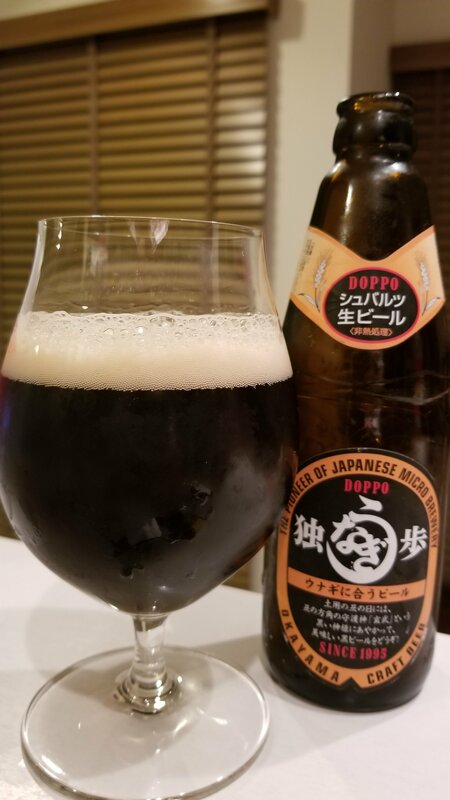 Doppo Black Beer for Unagi, as the name suggests, has been brewed to be consumed with Unagi – not the karate skill from Friends – but the grilled eel considered to boost stamina in the hot summer months in Japan. With this being winter though, we’re all out of unagi. Doppo Black Beer for Unagi poured out a black colour, with some hints of brown in there in the right light, along with a fluffy white head. The head quickly dissipated to a few oily streaks across the top of the beer and a few bubbles around the outside. There was a soft acrid black malt aroma to the beer, along with some hints of chocolate and coffee, followed up by a rustic earthy noble hop aroma. The aromas only got stronger as Doppo Black Beer for Unagi warmed up. The taste started off with the typical slightly acrid black malt flavour that segued into the more familiar roasted chocolate and coffee flavours associated with a schwarz. The flavours weren’t overpowering nor bold. However, Doppo Black Beer for Unagi was very soft in terms of carbonation and also water – perhaps it had been treated? The smooth body meant Doppo Black Beer for Unagi was also easy drinking though I don’t know how well it goes with unagi as I had none. It was winter! The beer finished off with a faint hint of lingering roasted malts and chocolate, but they faded fast. Doppo Black Beer for Unagi could maybe be a gimmick to shift more unagi, but it isn’t a bad beer by any means.